You rely on your all-utility task vehicles (UTVs) for the transportation of cargo loads across rough terrains. However, despite being among the most resilient recreational off-highway vehicles, these add-on accessories such as an enclosure will not only protect your side-by-side but also keep the vehicle in peak condition. Apart from gearing up your safety measures, these enclosures make sure the drivers are shielded from rain, snow, and other natural elements. Even the risk of enforcing a fatal-accident or falling-off the vehicle is removed when a driver has specially equipped his UTV with a side-to-side enclosure. 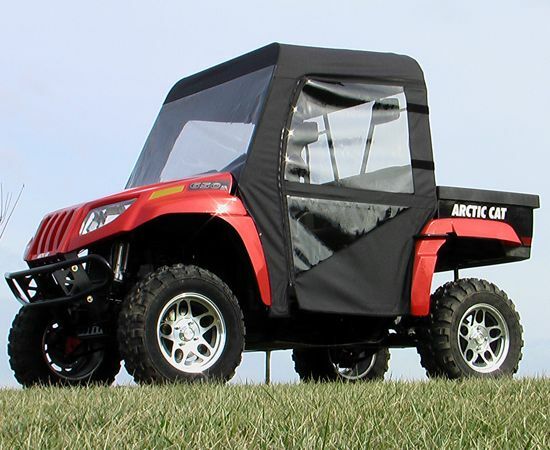 Keep your UTV journey accident-free and find a complete line of enclosures for various models; the Arctic Cat Prowler 650 H1, Arctic Cat Prowler 650 and other viable models including XT 700, XTX and XTZ versions. Find the best side-by-side UTV accessories online - with UTV Cab Enclosures.